A still from a video shows the hybrid solar eclipse of Nov. 3, 2013. The video was taken by taken by ESA satellite Proba-2 using its SWAP imager, which snaps the sun in ultraviolet light. The first solar eclipse of the year on Tuesday (April 29) won't be visible to most people on Earth, but a European satellite may capture images of the event for the whole world to see. "Our Proba-2 will try to catch tomorrow's solar #eclipse from space. Stay tuned!" European Space Agency officials announced Monday (April 28) via the ESA Science Twitter account, @esascience. This NASA chart shows the shadow path of the "ring of fire" annular solar eclipse of April 28-29, 2014. Tuesday's solar eclipse will be primarily visible to observers in Australia as a partial solar eclipse. But skywatchers who don't live along the eclipse path can watch the celestial event online. Both the Slooh commnity telescope and the Virtual Telescope Project will air live webcasts of the solar eclipse from Australia, starting at 2 a.m. EDT (0600 GMT) Tuesday. You can watch these eclipse webcasts live on Space.com. This won't be the first solar eclipse viewing for Proba-2, a small and relatively low-cost satellite that launched to low-Earth orbit in 2009 to study the sun and space weather and to demonstrate a variety of technologies. For example, Proba-2 observed a rare hybrid solar eclipse in November 2013, capturing images of the sun in ultraviolet light that served as valuable reference material for astronomers. A year earlier, in November 2012, the spacecraft also snapped photos of another solar eclipse. 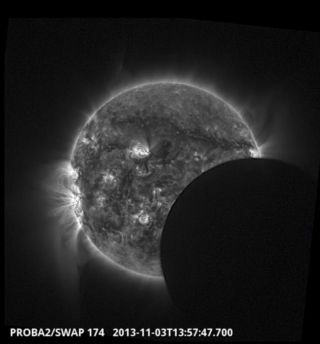 "Combining visible light observations with the extreme ultraviolet images from Proba-2 gives us a unique opportunity to access difficult-to-see regions of the sun at different wavelengths, during a rare event such as a total solar eclipse," Joe Zender, ESA's Proba-2 mission manager, said in a statement at the time. WARNING: Solar eclipses are potentially dangerous skywatching events. Never look directly at the sun during an eclipse with a telescope, binoculars or your unaided eye; severe eye damage can result. To stay safe, you can wear No. 14 welder's glass over your eyes, fit special filters over your equipment or project a magnified image of the eclipse onto a shaded white piece of paper. Tuesday's event is the first of two solar eclipses to occur in 2014. The second one will be a partial eclipse widely visible from the United States and Canada on Oct. 23. Editor's Note: If you live along the visibility path and snap an amazing picture of the April 29 solar eclipse, you can send photos, comments, and your name and location to managing editor Tariq Malik at spacephotos@space.com.